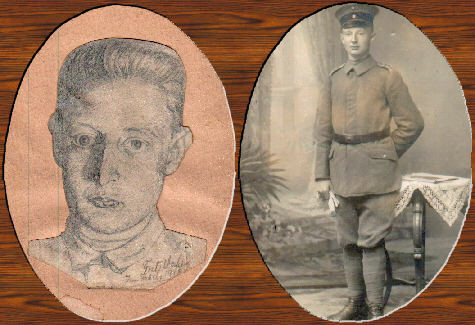 Here are a drawing and photo of my dad from WWI. He served in the German on Army on the Western Front - Ardennes Sector. He was a Funker or radio and morse code operator. Karl von Soest was born on October 2, 1898, in Wispenstein Kreis [by] Ahlfeld, This is in northern Germany not too far from Hannover. The lovely drawing is signed: Fritz Volters, Im Felde [in the field], 1918 Papa was a quiet thinker and not a passionate hunter. He was an offset printer who played the mandolin, wrote poetry. He believed in sports playing soccer, rowing a canoe and loved participating in hiking clubs ( wander Vereins ). Papa liked to read everything in sight and hid behind his newspaper wishing we would leave him alone. Only on long hikes through the Luneburger Heath would he talk to me, being an accident late in his life ( 1942 ) I must have been a joy to him.